Look, I am not saying that the Clintons or their contacts are guilty of murder— there hasn’t been anything close to evidence proving homicide. However, friends, contacts, and/or people investigating Bill and Hillary Clinton, have this nasty habit of turning up dead. We all gotta go sometimes, but these people seem to go to their maker under weird circumstances (and many by suicide). 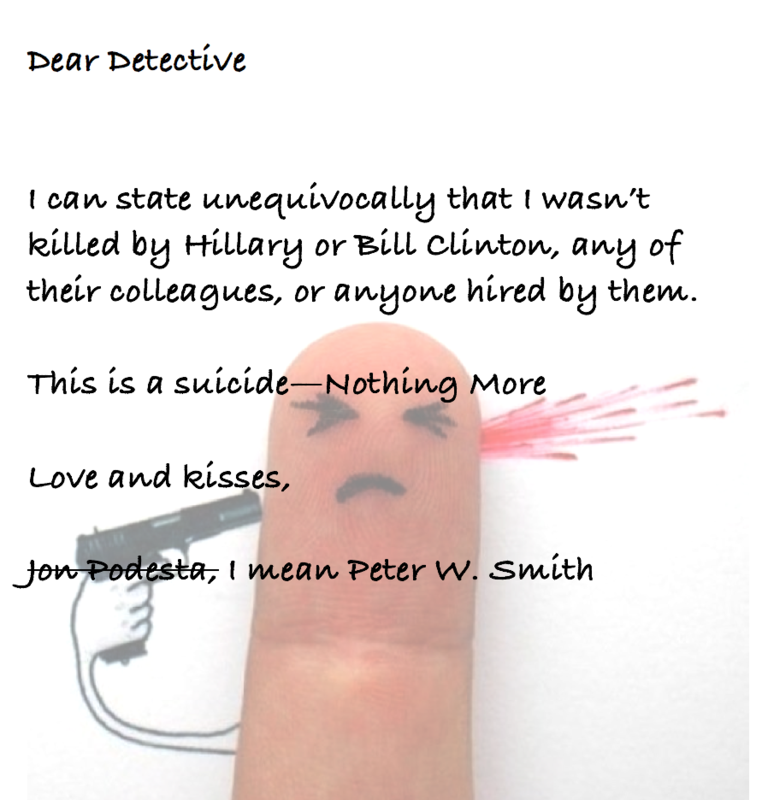 Republican operative Peter W. Smith has “committed suicide” at the age of eighty-one just days after he spoke with The Wall Street Journal about a Clinton investigation. 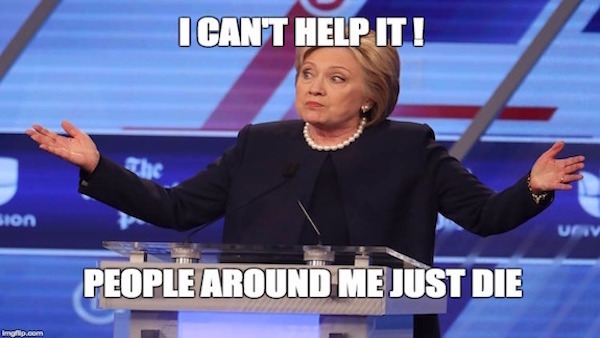 In the interview, he revealed that he had attempted to recover he 30k+ emails of Hillary Clinton that went missing. According to police though, he took his life due to his failing health. And if you believe in coincidences you may feel perfectly comfortable that his suicide had nothing to do with that WSJ story. In mid-May, in a room at a Rochester hotel used almost exclusively by Mayo Clinic patients and relatives, Peter W. Smith, 81, left a carefully prepared file of documents, including a statement police called a suicide note in which he said he was in ill-health and a life insurance policy was expiring. Originally, the reports read that he died of natural causes. It wasn’t until Thursday [7/13] that the details surfaced, revealing his death to be a suicide. He was reported to have been “found with a bag over his head with a source of helium attached,” the paper reports. Both a medical examiner’s report and evidence found by police confirm the finding. Police found a suicide note in which Smith underscored that “NO FOUL PLAY WHATSOEVER” led to his death; rather, a “RECENT BAD TURN IN HEALTH SINCE JANUARY, 2017” along with an expiring $5 million life insurance policy had prompted him to take his own life. “He had been staying at the hotel for several days and had extended his stay at least once but was expected to check out on the day his body was found,” the Tribunereports. According to police, Smith told a hotel worker, “Tomorrow is my last day,” while working at the hotel’s business center. In his talks with the Journal, Smith said he had organized a team to try to track down the thousands of emails deleted by Clinton, which he believed to be in the possession of Russian hackers. He had performed similar oppo research on Democrats in the past, including on “Troopergate,” which targeted Clinton’s husband. Smith stressed that he was working on his own volition, not at the behest of the Trump campaign. Of course it makes total sense that a guy who killed himself for among other reasons he wanted to die before his life insurance ran out would leave a note providing evidence that he killed himself so the insurance company wouldn’t pay out his policy. My friend Tami Jackson compiled a list and description of 47 seemingly odd Clinton-related deaths, thirty of which were published here at LidBlog. You can read part one here, find part two here, and the third part of the Clinton body count here.